We'll show ELOH at #GameCity Vienna. You'll find us in the @radiofm4 Indie Arena. P.S. : We'll even have more stickers! If you are in town coming Friday you should definitely come to the next @SUBOTRON arcademy. The lovely and great @hannahnicklin is coming to Vienna. And she will have opinions, very smart ones, as always. Come by, it will be really interesting! Speaking of the soundtrack of Old Man‘s Journey - if you’re into vinyl you can pre-order the super special limited deluxe edition over @iam8bit ! Here‘s a review for Old Man‘s Journey with a focus on the audio. Props go out once again to @scntfc for his outstanding work in a category that’s still too often easily overlooked. Looks like you can now pre-order the gorgeous vinyl edition of @scntfc’s Old Man’s Journey soundtrack at @WOW_HD. Should have better shipping options to Europe. Let us also join the @AppStore in reminding you that the Old Man's Journey soundtrack by @scntfc is utterly beautiful and available on iTunes. Check out this wonderful written review of Old Man’s Journey (contains spoilers!). Thanks for the kind (and well articulated) words! Yeeeees, we’re hyped! This is limited to 1000 copies, so order yours quickly! Hey all, we have news! We‘re immensely excited to announce our collaboration with iam8bit on the limited vinyl edition of the Old Man‘s Journey soundtrack! Old Man’s Journey’s wonderful music by @scntfc now finally has a limited edition double 10” vinyl soundtrack. Manufactured by the perfectionists at @iam8bit. Don’t miss this! Looking for a game to play this summer? Old Man’s Journey is joining @NintendoEurope’s #NintendoSwitch Summer Sale on #eShop. You have one more day on the European #PSN store to pre-order Old Man’s Journey for #PS4. 20% off for @PSPlusEU users! Oh hey look! Old Man’s Journey is exhibited at the amuseum of Pop Culture in Seattle! Thanks @bernhard_rieder for the heads up! Wow, Old Man’s Journey is nominated as a standout indie game for the #GooglePlay awards. We’re proud to be part of such an astonishing selection! There are two talks on Old Man’s Journey this Friday. @mcloister will be at #Reboot2018 in Dubrovnik and @Rostiger at #creativemornings in Vienna. Come say 👋! Old Man's Journey by @brokenrules is a really beautiful desktop game. Wonderful art style, illustrations and story, with a novel game mechanic. 👌 Feels like an interactive animated film or story book. Would love to build a game like this one day! 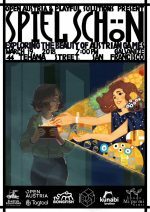 Dear friends - if you are at #gdc and want to experience something different join us (@brokenrules @bongfish @Mipumi @KunabiB) at „Spiel schön“ on 3/19 to explore the beauty auf Austrian Games. It will be schön! We have been picked Editors’ Choice by @PCMagME. Thx! We wonnnnnn two prizes! Runner Up and Unity Winner! Yeah! Thank you #PlayIndie! We are proud to announce that #OldMansJourney is joining the #Nindies family on #NintendoSwitch on Feb. 20th! Hey, anyone here attending @TaipeiGameShow? @rostiger is grinding the globe towards Taiwan today - come say hi!